Q. How do I make sure I am sending a photo at the highest possible resolution when I attach it to an email message on my phone? A. Before you send the photo, check the image-size settings when you attach the image to the message so you know you have selected a high-resolution picture. If you pick a low-resolution photo from the start, that is what your recipient will get. To help those with slow connections, limited-data plans or internet provider limits on attachment size, some mobile email apps can reduce the size of a photo attached to a message that’s going out. Choosing the “small" or “medium" size scales the image down, but also reduces the resolution when it arrives at its destination. Smartphone apps vary, but some can automatically resize photos, so check your default settings. 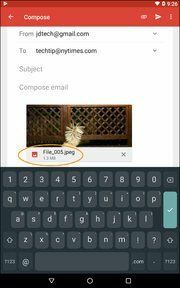 When you attach a photo to the iOS Mail app, choose Actual Size from the menu if you want to send it at the full image resolution. As for images attached to text messages, some wireless carriers might compress photos sent by SMS or with certain messaging apps. 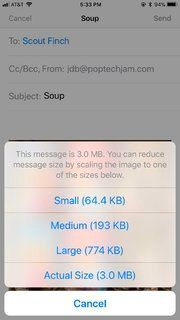 Some software, like iOS 11 for the iPhone, have an optional setting to automatically reduce the size of images sent with the iMessage service to lower bandwidth consumption. Desktop email programs like Microsoft Outlook and Apple Mail can also resize photos attached to messages you send. For images that exceed your mail server’s size limits, you can also share links to the high-resolution files with tools like Apple’s MailDrop, Gmail using Google Drive or Microsoft OneDrive — services that are often integrated into your mail program to do the heavy lifting anyway. Third-party file-sharing services like Box, Dropbox and iDrive have a similar function. A version of this article appears in print on January 18, 2018, on Page B6 of the New York edition with the headline: Sending Photographs At High Resolution.